Fulham - Obstacle course fun! There has been a strong autumnal feel in the forest this week with the colour of the trees ranging from bright gold and rust colours to vibrant berry-reds. The children were quick to observe the stunning colours on their walk to base camp and some decided they wanted to collect some of the fallen leaves for using in creative activities later on. After snack time, the children spent time discussing what they wished to use the leaves for and experimented with various ideas, some painted the leaves, some decided to hole punch the edges and others printed their hands on them. 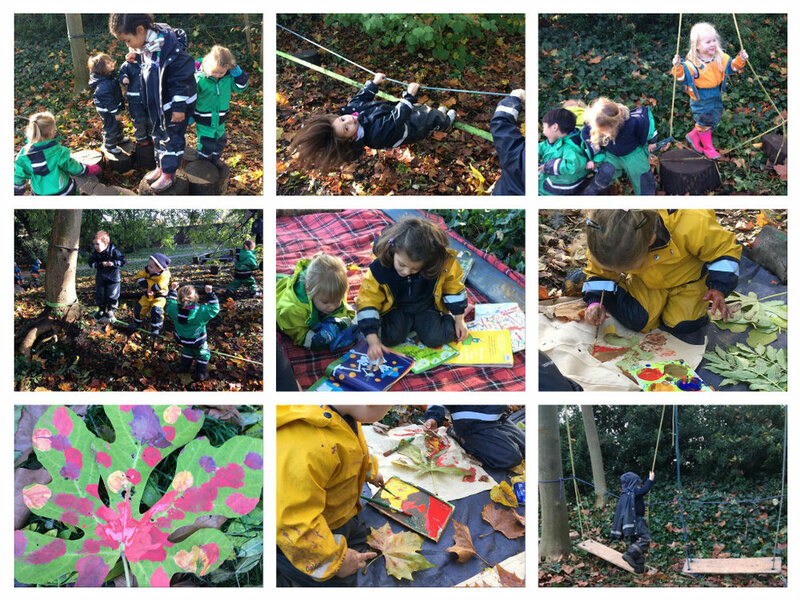 It was amazing to observe how inventive they became with the resources in the forest, transforming the leaves through creativity and imagination. The children have been in great spirits this week, bursting with energy! We have been building new and exciting obstacle courses every day with them and the children thoroughly enjoyed the physical challenges that they present. We’ve had spider webs created from all our ropes being weaved together, wobbly rope bridges suspended in the trees and tree stump stepping stones that went higher, and higher and higher. Some of the educators even had a go but we were not nearly as competent as the children! In between the high energy activities, the children have also enjoyed the quieter areas of our base camp like the reading tent where the children have been listening to their favourite stories, and resting for a while during which some also had their faces painted as Stormtroopers, princesses, pirates and dinosaurs! We also had an unexpected visitor in our camp on Wednesday, a fox! One of the children noticed the fox while we were having our morning snack and it resulted in everyone excitedly following its whereabouts, including the educators! It roamed around the site for a few minutes before disappearing again. Of course, we were all interested in our visitor and so a few of the children went investigating with Jo, and to our surprise we found its den! We had a look around and the children discussed where they thought the fox was, why we had to be very careful near its ‘home’ and why it may have visited our site. It has been another lovely week in the forest with both the rain and the sun joining in our play as the children continue settling so smoothly into our new setting.